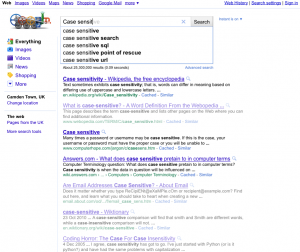 Google does not support "case sensitive" searches (and here and here). It does seem to return slightly different results depending on the case of the search query, but if you are only interested in the exact "case sensitive" matches you're on your own. Case Sensitive Search Firefox Extension: it works with Firefox 3 and 4. Case Sensitive Search Bookmarklet: just create a bookmark using the following code as url and click it when on a Google search page.